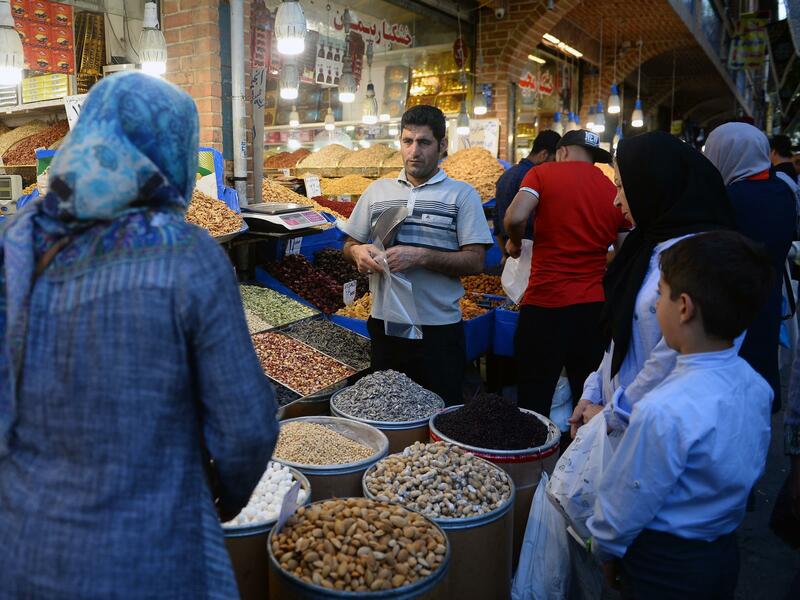 The unanimous ruling from the International Court of Justice orders the U.S. to allow Iran to import food, medical supplies and other products for humanitarian reasons. Here, people browse for goods in the Grand Bazaar in Tehran. In response, Secretary of State Mike Pompeo said that because of continuing disputes with Iran, "I am therefore announcing today that the United States is terminating the Treaty of Amity with Iran" — referring to the 1955 treaty that laid out economic relations between the two countries. The document was cited by the International Court of Justice. "This is a decision, frankly, that is 39 years overdue," Pompeo said as he announced the U.S. response, making an apparent reference to Iran's Islamic Revolution of 1979 and the rise of Ayatollah Khomeini. The unanimous ruling from the court orders the U.S. not to restrict money flowing between Iran and its trading partners for a list of products that it says should be cleared for export to Iran — from medical devices and agricultural commodities to parts and equipment needed to safely maintain Iran's civil aviation. Limiting food and medical products "may have a serious detrimental impact on the health and lives of individuals on the territory of Iran," the court said. Hours later, Pompeo said the U.S. had always intended to leave humanitarian exceptions to the sanctions in place. He also said the international court had no jurisdiction to intervene in the U.S. punishment of Iran, and that Iran's claims were without merit. Iran filed the case in July, after President Trump withdrew the U.S. from the Joint Comprehensive Plan of Action — the Iran nuclear deal that was reached in 2015. The court's ruling also referred to the 1955 treaty of amity. The court's ruling leaves intact U.S. sanctions that cover a range of Iranian economic activity, from exports of carpets and food to financial transactions and trade in metals. In Iran, the threat of renewed sanctions has been taking a toll since at least the spring. "Since, let's say, March, there has been unprecedented acceleration in the prices of everything — almost everything," Armin, a high school teacher in Tehran, told NPR's Peter Kenyon. The prices of a few items, like fuel and bread, were tightly regulated, he added. Armin asked that his last name not be used. The ruling comes one month before the Trump administration is due to impose another round of sanctions on Iran, on Nov. 4. That's when the country's oil industry will likely be targeted. When the first round went into effect in August, Trump said in a tweet, "These are the most biting sanctions ever imposed, and in November they ratchet up to yet another level." During the U.N. General Assembly last week, Trump doubled-down on these sentiments and repeated warnings that anyone who conducts business with Iran would be punished. He also said that after the November sanctions go into effect, the U.S. would "pursue additional sanctions, tougher than ever before, to counter the entire range of Iran's malign conduct."